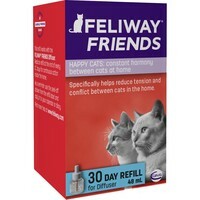 The Feliway Friends Refill is for use with the Feliway Friends Diffuser 30 Day Starter Kit to help reduce or prevent conflicts and tensions between household cats. Feliway Friends is a synthetic copy of the cat appeasing pheromone (CAP) which is produced naturally by the mother after giving birth. It helps to create a bond between her and her kittens, and create a harmonious environment where they can feel safe. The synthetic version has much the same effect when used in the home and has been shown to reduce signs of conflict and aggression between housemate cats. The refill will last approximately 4 weeks (30 days). I've tried the original Feliway in the spray and defuser form and also the Feliway friends, I didn't find any of them worked for my cats, they didn't make a difference at all. This has calmed my two teenage sibling cats down. Much less aggression than previously. Would reccommend. Having bought the starter kit, to see if the statements made by Feliway lived up to the reality - I can recommend this product if you have kittens that seem to be always fighting. No longer!! I am now on my refill, and will be continuring use of this great product. This definitely seems to do the job it's meant to do and has a calming effect on my 2 cats.